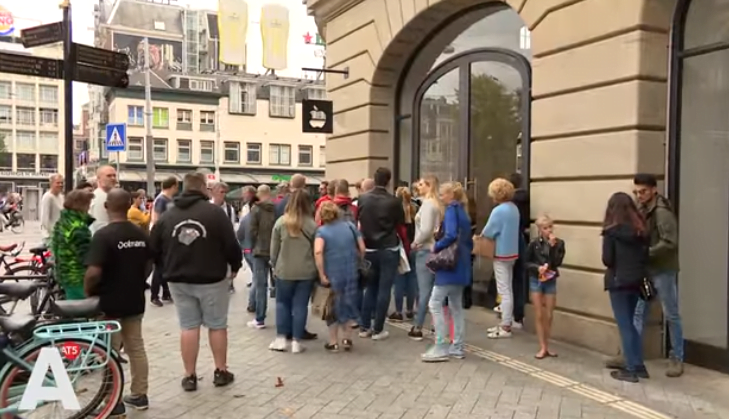 Update: An Apple spokesperson told ValueWalk, “We’re currently investigating the incident that took place at Apple Amsterdam on Sunday. Our staff were able to evacuate customers quickly and safely and the store re-opened shortly afterwards.” The spokesperson added that Apple Store employees had quickly alerted the fire department and medical professionals, who confirmed that no employee required any medical attention. No customer was harmed in the incident. If you find your iPad battery heating up unusually, head over to the nearest Apple Store to get the battery replaced at the earliest. On Sunday, an iPad battery exploded in Apple’s Amsterdam store. Fortunately, no Apple store employee or customer suffered any serious injuries. The store employees were smart enough to place the device in a container filled with sand to prevent the further explosion. There was no fire. What caused the iPad battery explosion? According to local media outlet AT5, the iPad battery continued to release harmful substances after being placed in the container. It caused three employees some breathing difficulties. The affected employees were treated by the first responders, and they are out of danger. The store was evacuated immediately and closed for some time on Sunday afternoon. AT5 posted a video showing the empty store with customers standing outside. Things went back to normal by 3PM local time on Sunday as customers were allowed back into the store. Incidents of the iPhone or iPad battery explosions are pretty rare, but they do happen. In January this year, an iPhone battery exploded in an Apple Store in Zurich, Switzerland. The incident occurred when a repairman was trying to remove the battery. It overheated and burned the employee’s hand. Last year, we came across multiple reports of the iPhone 7 Plus exploding in the hands of its owners. One user claimed his iPhone 7 Plus caught fire in his car, causing some serious damage to the vehicle. It’s worth pointing out that despite all the advancements in battery technology, lithium-ion batteries remain vulnerable to overheating and exploding. The iPad battery explosions have also happened in the past. Back in 2013, a Vodafone store in Australia was evacuated after an iPad Air burst into flames. The biggest battery explosion incident in the recent past was Samsung’s Galaxy Note 7. Hundreds of users found their Note 7 overheating or catching fire. Samsung was forced to recall the devices, fix the issue, and relaunch it. But even relaunched units with supposedly safe batteries were found to be exploding. Airport regulators in dozens of countries banned passengers from carrying the Note 7 in fights. Samsung eventually killed the device. Following the Note 7 disaster, the Korean company introduced an eight-point battery safety check to prevent such problems in the future. Apple is preparing to launch two new iPad Pro models in September or October. The code in the iOS 12 developer beta has confirmed that the new iPads would sport slimmer bezels and no physical home button. The Touch ID fingerprint sensor will be replaced by the Face ID technology. The upcoming iPad Pro models will continue to use LCD screens instead of switching to the more expensive OLED panels. According to TF International Securities analyst Ming-Chi Kuo, Apple would launch a 12.9-inch iPad Pro and an 11-inch iPad Pro. The new tablets are rumored to pack 4GB RAM, 64GB base storage, and an eight-core A11X Bionic processor.